BEST Muffins Ever! We visit the area frequently and a trip to The Store for muffins is becoming a tradition for sure. We love this quaint general store/eatery. A trip to Anacortes is incomplete with out a stop at The Store. 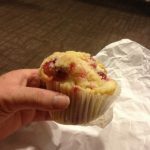 Cannot say enough good things about the store and wish I lived closer for ther muffins. They’ve made low fat muffins that were to die for. YUMMY! YUMMY! YUMMY! This place is as close to “perfect/convenience” location, selection, so nice. One of the last places that you feel welcome, please don’t go “commercial”. I’ve been living in the neighborhood for several weeks now. Having “ The Store “ within a short walking distance from my home is a delight. Upon every visit, the very considerate staff always make me feel welcome, and every hand made item I’ve purchased has been a reflection of the caring nature of everyone who’s employed there. The Store makes living in Anacortes more enjoyable. I couldn’t imagine living here without you all. Lots of Love. We found The Store by accident. It definitely has the best muffins. Stopped there on the way to the islands and on the way back. Ate mine without sharing. In Maryland without your muffins! I don’t know how we’ll survive in Maryland without your muffins! They’ve been a staple for our Sunday mornings for the last three years! So very yummy! Wonderful muffins and friendly faces! Your wonderful muffins and friendly faces are a perfect start for any day. The baked goods are so beautiful and the flavor is amazing. I love it. Everyone should at least try The Store once! ’cause you will definitely want to go back a second time! A muffin stop is a requirement. I live here, but I am not allowed to leave town when travelling to my sisters in Oregon or my Mothers in Eastern Washington without stopping here first. My family and friends love your muffins and so do I. Thank you.